Reserveren: meld je tijdens GOGBOT bij het infopunt op de Oude Markt of geef je voorkeur voor een dag door via een mailtje. Take part in building the Mute Synth and a large group performance with Dirty Electronics. 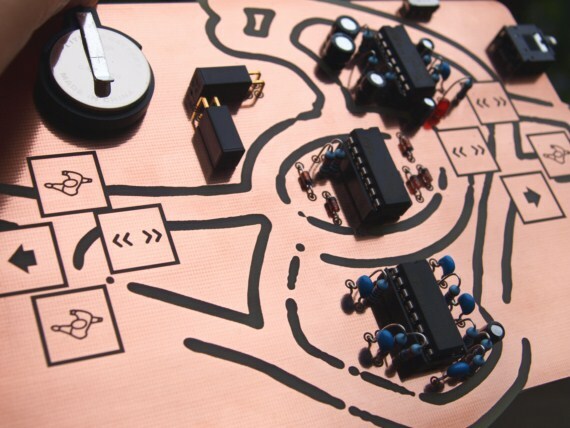 The Dirty Electronics Mute Synth is a hand-held touch and tilt instrument with copper etched artwork and contoured printed circuit board that was designed in collaboration with the legendry Mute Records. The instrument combines sound synthesis with a sequencer/pulser, and it is knobless. The Mute Synth is controlled by using the conductivity of the human body to complete the instrument’s circuit when the copper etching is touched. There are touch points on both sides of the circuit board, and the instrument is designed to be played with thumbs and fingers. Two tilt switches on different planes allow for gestural control of the sequencer. Pulsating brilliant white noise and grunge in the hand!